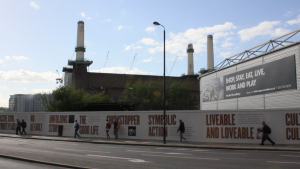 Architect Keith Garner is voicing strenuous objections to the so-called ‘regeneration opportunity’ at Nine Elms in Battersea. Wandsworth council and developer St James are proposing the construction of tower blocks of 16,000 new homes, along with shops, offices and a tube extension. He went to see an interactive model of the area, along with videos and other visual displays at the exhibition at Battersea Studios, off Silverthorne Road. 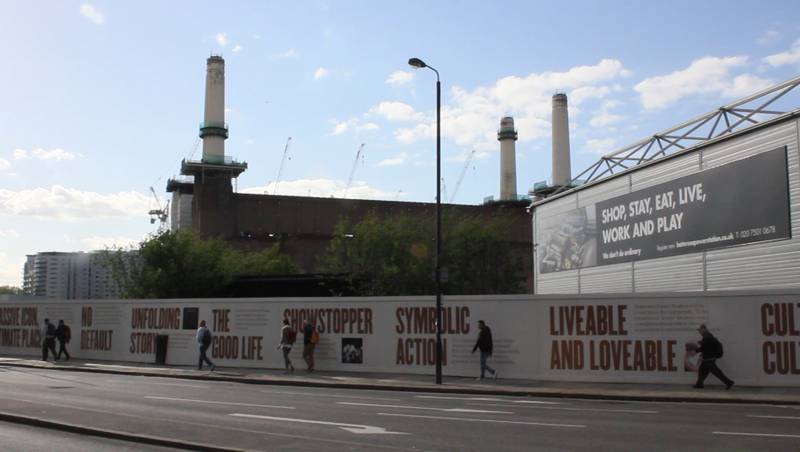 Garner, who is also a member of the Battersea Power Station Community Group, is objecting to what he views as a “deeply unattractive project,” on three grounds: the destruction of views, especially of Westminster Palace, the disappearance of promised open green spaces and thirdly, the nonsensical positioning of the new northern line extension from Kennington. To allow a battery of tower blocks to be built at the east of the area towards Vauxhall would ruin the ordinary public’s views upstream from Waterloo and Westminster and downstream from Battersea and Chelsea, points out Garner, apart from residents and tenants of the new development. Millbank Tower, now a Grade II listed building, was consciously designed to replicate the proportions of Victoria Tower nearby. 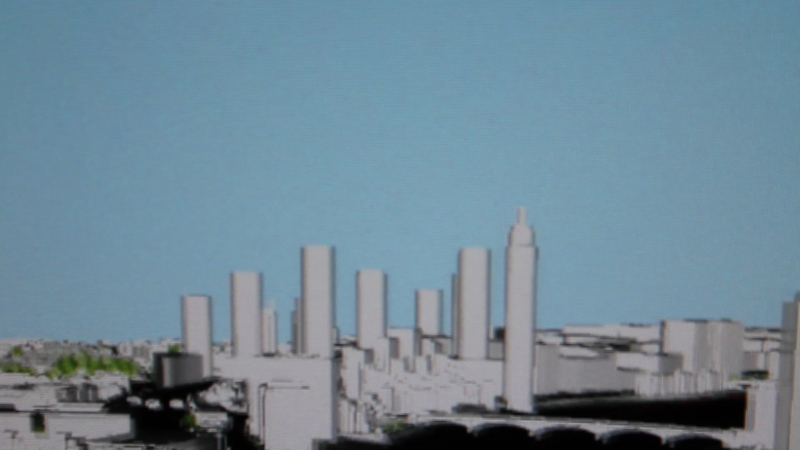 However, its presence should not be used merely to justify yet another “collection of banal residential and office towers,” which are likely to spoil the backdrop of the Palace of Westminster looking down Whitehall. The architect also noted that the linear park ‘green swathe’ that was such a redeeming feature and justification for the project had vanished from the model! He said it was clear from speaking to Wandsworth Borough Council (WBC) staff at the exhibition that the developers were just ignoring the requirement to have a large green open space and that they had no real power to make them provide it. “Shouldn’t the areas designated as green swathe have been compulsorily purchased or handed over by the developers to WBC?” he remonstrated. In addition, there was a missed opportunity to move Nine Elms Lane back from the river to the approximate line of the lamented green swathe, as the narrow sites between Nine Elms Lane and the river are so pinched and uncomfortable. This would enable larger sites adjacent to the river and the possibility of more substantial riverside public space than the customary 10 metre wide riverside walk. Moving the road may or may not be a good idea, but could at least have been been investigated. Bigger blocks should be up towards Wandsworth Road, not right by the river. 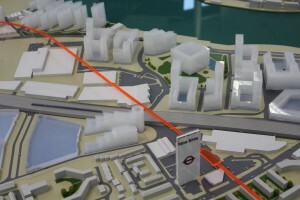 As we have mentioned here on the Spectacle blog previously; owners of Battersea Power Station, REO (Real Estate Opportunities), have some illustrious plans to bring the Northern line to the Power Station. The project has received support from the mayor’s office but no public money is being put towards it from either the mayor’s office or the Department of Transport. 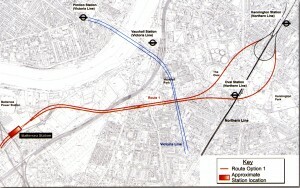 This extension would serve to sever the two branches of the Northern Line so that only Bank services would travel to Morden and Charing Cross services would end in Battersea. As it is very few Charing Cross branch trains travel past Kennington. Far from benefiting the local community, this extension is effectively an attempt to build a private station for a private development with little to no concern for the local people. In typical architectural consultation manner, they’ve produced 4 proposals and asked people to choose which one they believe will be the most beneficial. One of these maps is reproduced below and they can also be found over at London Reconnections along with some other useful information about the extension plans. 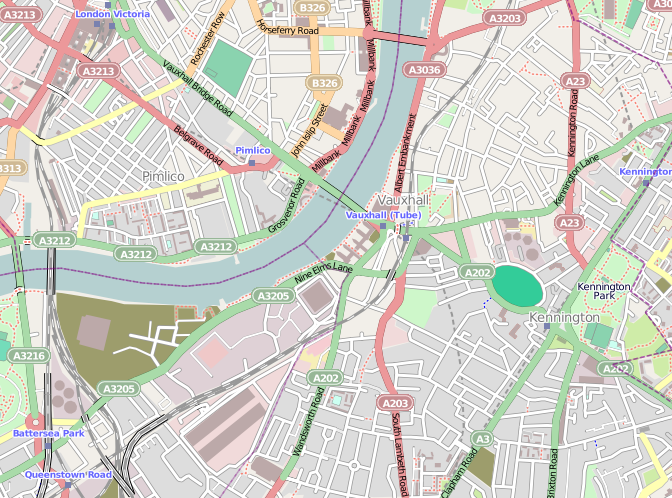 As can be observed on the below map taken from OpenStreetMap, REO’s consultation map conveniently crops Victoria station and forgets to label Queenstown Road and Battersea Park stations. The South London Line which runs from Victoria and London Bridge passes through Battersea Park station thus the Power Station site is already connected to these two major stations. 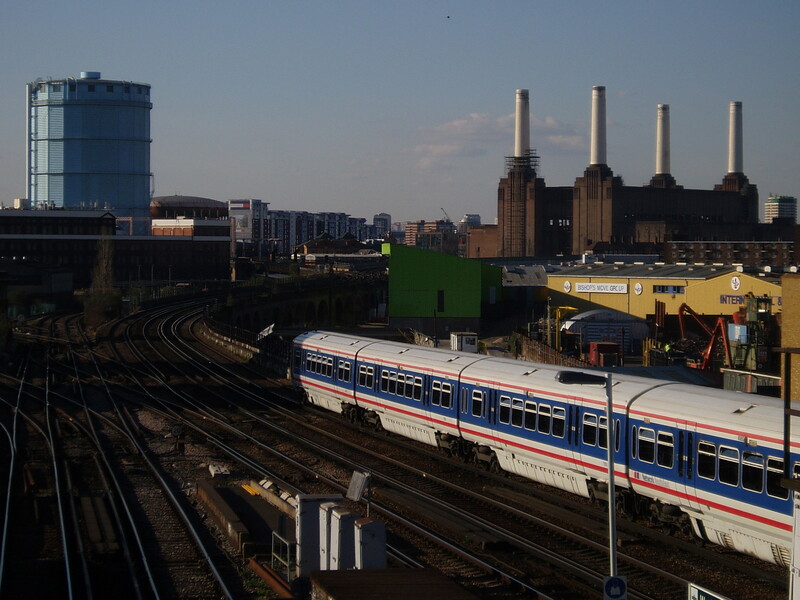 Additionally Queenstown Road station, five minutes walk from the Power Station site, is one stop away from Vauxhall Station. With these two connections to major stations very nearby, surely extending the tube to the area is a bit over the top? Tunneling is not a cheap process after all. 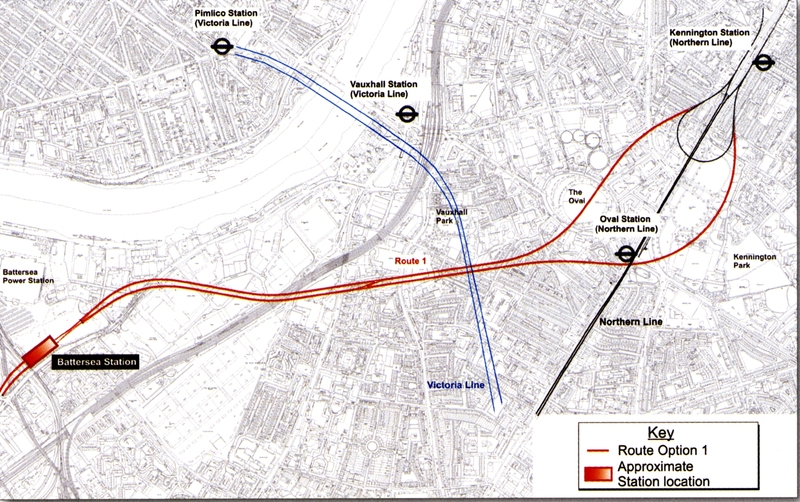 Another proposal suggests extending the Northern Line to Vauxhall en route to the new Battersea station, but as we mentioned, Vauxhall is already easily reachable from Queenstown Road station and is in fact actually quite a crowded station already. The other two proposals suggest an intermediary station in Nine Elms, either around New Covent Garden Market or at the site of the current Sainsburys. The intention here is to serve the Nine Elms opportunity area and the new planned US Embassy (allegedly their 12 storey embassy building requires some underground facilities). However a few more buses in the area could easily serve this purpose or even a small tram service which would be far cheaper than costly tunneling. Besides, Vauxhall is really only a short walk away. The consultation has included a Freepost Questionnaire for anyone who would like to inform Treasury/REO how they feel about the proposals. It is also worth considering that Treasury Holdings are conducting the consultation themselves and likely have no obligation to share the results. Either way, how would the public know that any published results of the consultation would match up with the actual results?